In the previous tutorial, I showed you how to deploy Ansible AWX via docker. In the meantime, I've found two projects that build rpm packages for AWX. 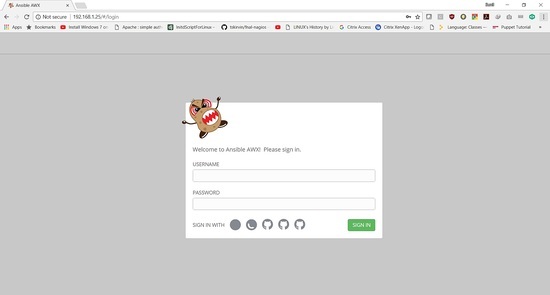 So in this tutorial, I will show you how to install Ansible AWX from RPM files on CentOS 7. 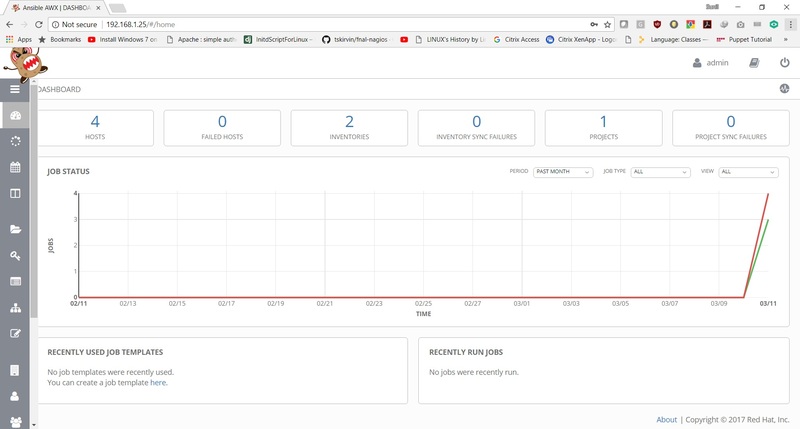 Ansible AWX is the OpenSource version of the Ansible Tower software. I will be using 3 servers with CentOS 7 minimal installation and SELinux in permissive mode. We need postgresql 9.6 for AWX installation. Installing the other necessary rpms. Created symlink from /etc/systemd/system/multi-user.target.wants/awx-cbreceiver.service to /usr/lib/systemd/system/awx-cbreceiver.service. Created symlink from /etc/systemd/system/multi-user.target.wants/awx-celery-beat.service to /usr/lib/systemd/system/awx-celery-beat.service. Created symlink from /etc/systemd/system/multi-user.target.wants/awx-celery-worker.service to /usr/lib/systemd/system/awx-celery-worker.service. Created symlink from /etc/systemd/system/multi-user.target.wants/awx-channels-worker.service to /usr/lib/systemd/system/awx-channels-worker.service. Created symlink from /etc/systemd/system/multi-user.target.wants/awx-daphne.service to /usr/lib/systemd/system/awx-daphne.service. Created symlink from /etc/systemd/system/multi-user.target.wants/awx-web.service to /usr/lib/systemd/system/awx-web.service. Create a user on all the 3 hosts. Here in this tutorial, I am creating a user ansible on all the 3 servers. Check the passwordless login from AWX server. In the next tutorial will show how to add a playbook and run the job. Is this necessary to run Ansible? Yeah it would be nice if OP included that in their blog post. I hit this problem as well. I tried to login using admin and password credentials but they don't work. What is the correct username and password to login awx console...? Check your sestatus; rerun AWX setup, then reboot. I'm getting the error 502 bad gateway. the install was done on centos 7 minimal and httpd service was never installed. If I put the original nginx.conf file back, it works fine. Any ideas? I got the same error, I had to reboot the system which fixed the issue. Please provide a link to "the next tutorial" which shows us how to add a playbook and run the job. First, nice work. Thank you for putting all of this together. Though my being a SysAdmin, and thus lazy by definition. Might I offer a few changes for consideration? Installing the packages seperately just extends things. Install all of the packages at the same time, where it makes sense. (ie. yum -y install postgresql96-server rabbitmq-server wget memcached nginx ansible) This allows for fewer steps and inturn less chance of the fat-fingers. Second, less steps. All of the steps where you are enabling and starting services in two commands, can be done in one step. The worse case of this being the awx services. (systemctl start --now awx-cbreceiver awx-celery-beat awx-celery-worker awx-channels-worker awx-daphne awx-web) Any errors or issues are still apparent, but again, less chance for screw-ups to happen. Please do not use the following repo as indicated in the documentation for installing awx https://copr.fedorainfracloud.org/coprs/mrmeee/awx/repo/epel-7/mrmeee-awx-epel-7.repo . The build on that repo has failed and when you use it you will run into multiple issues like SCM clones not working and others. Please use the following repo instaed "https://copr.fedorainfracloud.org/coprs/mrmeee/awx-dev/repo/epel-7/mrmeee-awx-dev-epel-7.repo". Can I make a environment with two nodes running Ansible managed by just one AWX? One to manage a network and other to manage another network? Can we update the awx version. Great Work ! My installation works perfect, I was trying to make inventory sync with AWS Credentials but I am error as " ERROR! No inventory was parsed, please check your configuration and options." My config file ansible.cfg I tried to modify the inventory parameter "#unparsed_is_failed = true". But the issue still exists . I am confused my why awx unable pick the inventory setup ? The follow-on tutorial on how to add a playbook and run a job would be extremely useful. you can use either httpd or nginx as both runs at port 80. - like a previous poster, I'm trying to make inventory sync with both Satellte (Spacewalk) and Vcenter. And like the previous poster, I also get " ERROR! No inventory was parsed, please check your configuration and options.". My config files seem correct. - when I run a job, status remains on "Running". I have to refresh the browser to see the output of the run (whether successful, or not). Hi, Nice tutorial! I have installed it. Nice work. But I am curious. Why did you have to disable fireawall? What is the impact on having firewall enabled? I have tried the steps and with some changes , I was able to successfully get the awx working. I tried the steps on amazon linux v2. Thank you for this article. I was breaking my head for the awx installation for the last 4 days. Few days after I have installed I updated my box using yum update. Riught afetr that, my box stays stucked for hours at a page showing " AWX upgrading". The url shows "http//<IP_ADDRESSE>/migrations_notran". We change the admin user password and now cannot login from the web portal. Will there be a clustering installation guide ? Same (following the guide to a T). Apparently, the AWX people switched away from celery. Not sure the importance it has on this project. [[email protected] ~]# systemctl start awx-celery-beat [[email protected] ~]# systemctl start awx-celery-workerGetting error :[[email protected] nginx]# systemctl start awx-celery-beat Failed to start awx-celery-beat.service: Unit not found. [[email protected] nginx]# systemctl start awx-celery-worker Failed to start awx-celery-worker.service: Unit not found. Can't even get login page. Port 80 is listening with nginx but browser is dead end and lynx shows bad html error. For some reason /websocket is not working for me. "failed: WebSocket is closed before the connection is established." Same error. "Failed to start awx-celery-beat.service: Unit not found." I don't see a solution anywhere. I tried the awx-dev repo and had the same issue. Is there a solution?